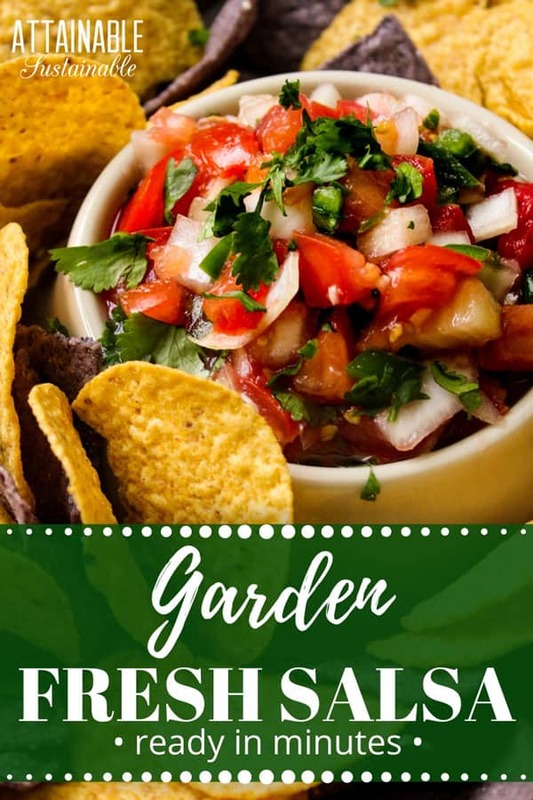 Garden Fresh Salsa Recipe for Straight Out of the Garden Salsa! Memorize these five ingredients; you’ll never need a salsa recipe again. 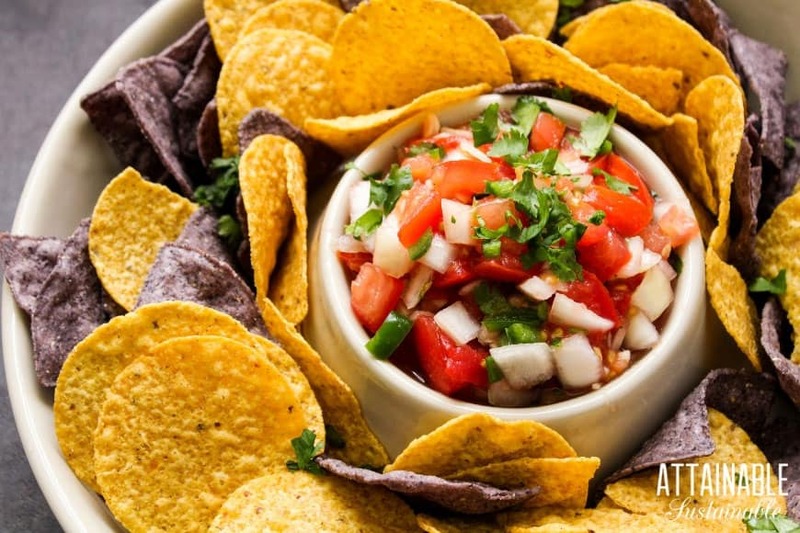 Nothing beats this easy garden fresh salsa recipe — it’s my family’s favorite summertime snack. My method for this garden fresh salsa recipe is simple — there’s no measuring involved. 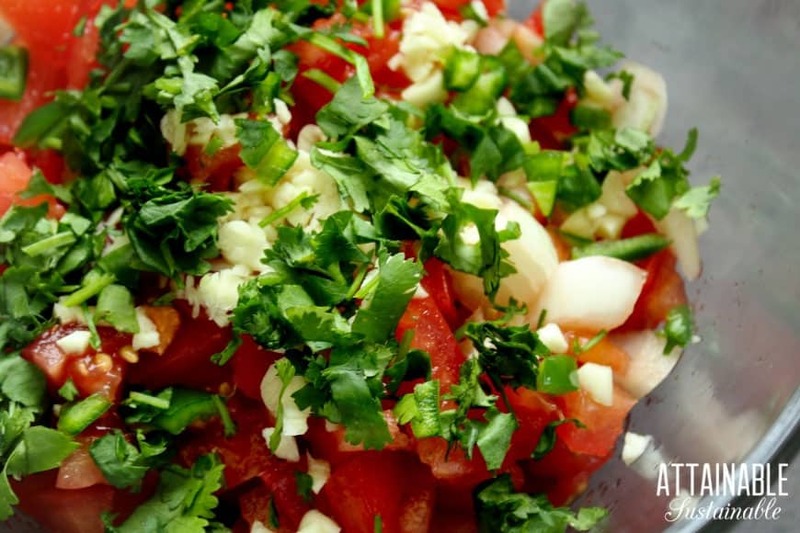 Memorize these five ingredients: tomato, hot pepper, onion, garlic, and lime. You’ll never need a salsa recipe again. The most important ingredient for killer fresh garden salsa is—bar none—garden fresh tomatoes. Those barely-pink orbs you’ll find at the grocery store? Don’t even bother. Seriously. You will be disappointed. Because that is not actually garden fresh salsa, now, is it? But if you’ve got a garden that’s brimming with juicy ripe tomatoes and hot peppers or if they’re available at your local farmers market, get chopping. Feel free to adjust the quantity of ingredients to suit your preference. More garlic is always a good bet. If you like things extra spicy, add another hot pepper. No lime? Feel free to substitute lemon juice. Cilantro is optional, of course. As if you need any help with this! Definitely enjoy it fresh. Serve it up with your favorite organic, non-GMO tortilla chips. Or use it to top tacos, tostadas, or refried beans. If you’re looking for a great recipe to preserve your bounty, I suggest you try this salsa recipe for canning. It’s one of our favorites. This fresh garden salsa is a summertime treat. Memorize these five ingredients; you'll never need a salsa recipe again. Nothing makes salsa as good as fresh ingredients from the garden. 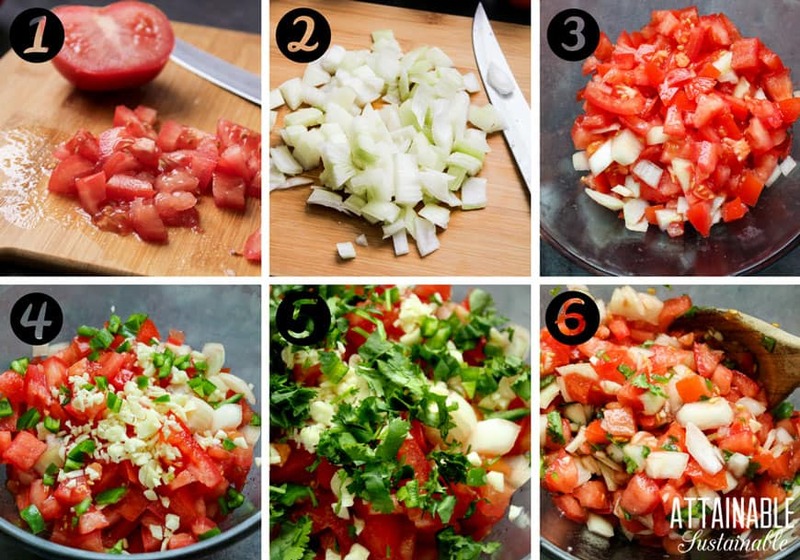 Chop tomato and onion into a quarter-inch dice. Stir all ingredients together in a bowl. See how easy that was? If you'd like, you can add salt and pepper to taste (I usually add about 1/2 teaspoon of each). And if you're a cilantro lover like I am, you can add about 2-3 tablespoons of chopped fresh cilantro. Note that I did not add cilantro as a mandatory ingredient. It's not for everybody! Feel free to adjust the quantity of ingredients to suit your preference. If you like things extra spicy, add another hot pepper. No lime? Feel free to substitute lemon juice. Cilantro is optional, of course. Thanks, Rachel! My son is my photographer these days. There will be a steep learning curve for me when he moves out! 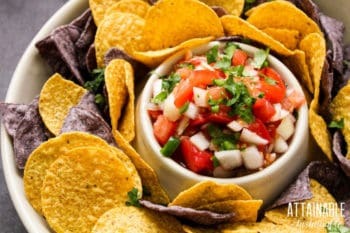 Do you remove the tomato seeds and pulp, so that it doesn’t cause the salsa to be overly watery? I don’t see that mentioned anywhere. Thank you. Well. I don’t think I’ve ever kept it more than a day or two; my guys usually finish it off in a hurry! My estimation would be a week, though, give or take. Easy to make and so yummy. I will definitely make this again!